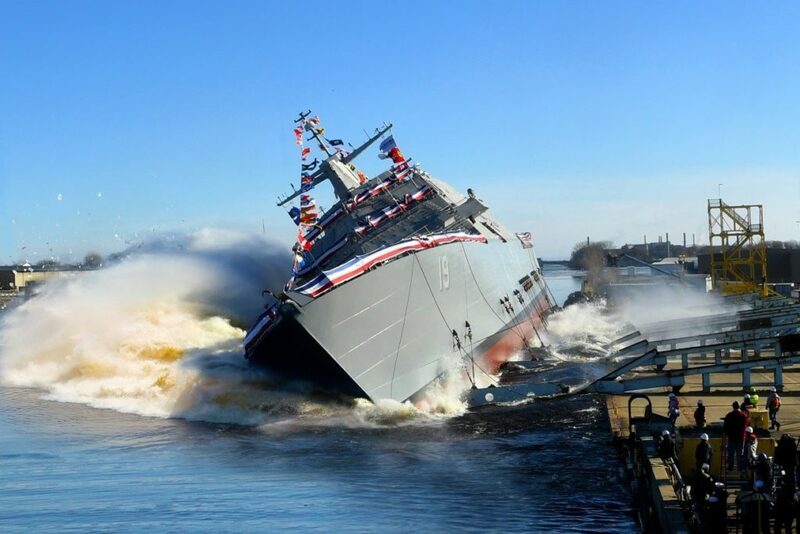 The Lockheed Martin-led shipbuilding team launched Littoral Combat Ship (LCS) 19, the future USS St. Louis into the Menominee River at the Fincantieri Marinette Marine Shipyard. 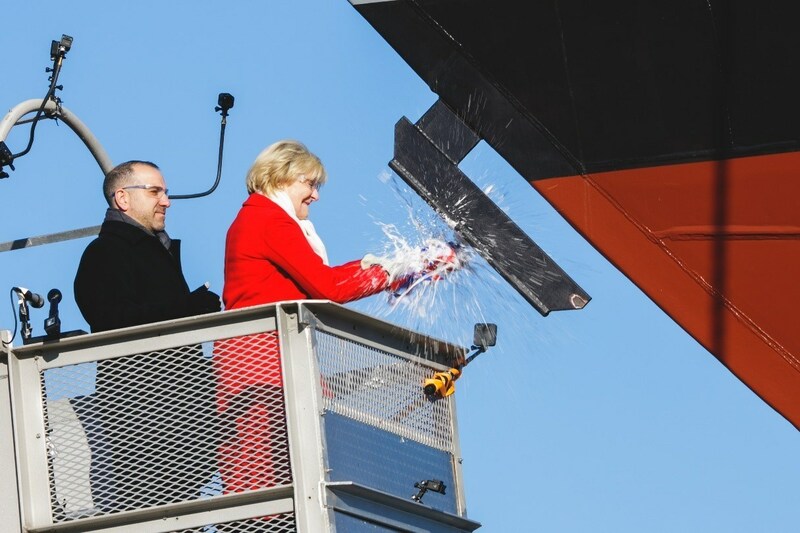 Ship sponsor Barbara Broadhurst Taylor, the daughter of a decorated World War II aviator, christened USS St. Louis (LCS-19) just prior to launch. «USS St. Louis (LCS-19) is the second ship we’ve christened and launched this year. Our shipbuilding team has truly hit its stride. We completed trials on three ships and delivered two more. Once delivered to the U.S. Navy, USS St. Louis LCS-19 will be on its way to independently completing targeted missions around the world», said Joe DePietro, Lockheed Martin vice president and general manager of Small Combatants and Ship Systems. «We remain focused on delivering these affordable ships to the fleet as quickly as possible and increasing capability with each hull». The Freedom-variant LCS integrates new technology and capability to affordably support current and future missions from deep water to the littorals. LCS is a highly maneuverable, lethal and adaptable ship, designed to support focused mine countermeasures, anti-submarine warfare and surface warfare missions. USS St. Louis (LCS-19) is targeted to support the mine countermeasures mission. Lockheed Martin is in full-rate production and has delivered seven ships to the U.S. Navy. There are seven ships in various stages of production and test at Fincantieri Marinette Marine. This year, the Lockheed Martin-led team began construction on two ships, delivered two ships, completed sea trials for three ships and saw one delivered ship commissioned. LCS-13, the future USS Wichita, is slated for commissioning in Mayport, Florida, on January 12. «I am thrilled and very honored to be the sponsor of the future USS St. Louis (LCS-19). The combination of my family’s military background and the enduring spirit of the great city of St. Louis make this incredibly meaningful», Taylor said. «This is the seventh ship to bear the name St. Louis, and I know that the people of our great city are extremely proud that this distinguished legacy will continue». Unique among combat ships, LCS is designed to complete close-to-shore missions and is a growing and relevant part of the U.S. Navy’s fleet. It is flexible – with 40 percent of the hull easily reconfigurable, integrating capabilities like the Longbow Hellfire Missiles, 30-mm guns, and manned and unmanned vehicles targeted to meet today’s and tomorrow’s missions. 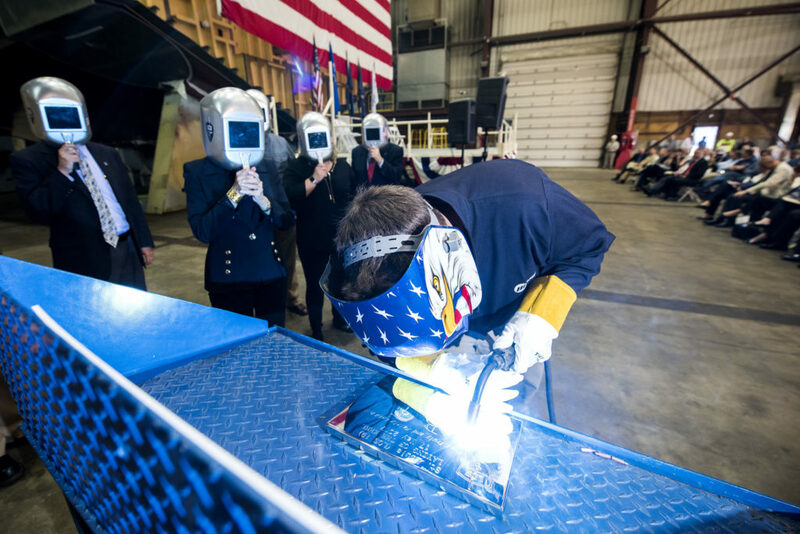 «We are proud to be building USS St. Louis LCS-19 and her sister ships at the heartland’s only naval shipyard», said Jan Allman, Fincantieri Marinette Marine president and CEO. «Today’s launch and christening is a testament to the hard work of more than 2,000 workers who pass through the shipyard’s gates, put on their hard hats and build American warships». On May 17, 2017, the Lockheed Martin-led industry team officially laid the keel for the U.S. Navy’s 19th Littoral Combat Ship (LCS), the future USS St. Louis (LCS-19), in a ceremony held at Fincantieri Marinette Marine in Marinette, Wisconsin. Ship sponsor Barbara Broadhurst Taylor completed the time-honored tradition and authenticated the keel by welding her initials onto a steel plate that will be placed in the hull of the ship. «It is a tremendous honor to serve as the sponsor of the future USS St. Louis», Taylor said. «The keel-laying ceremony is a great milestone, and I look forward to supporting the ship and its crew throughout the building process. I know the people of St. Louis and Missouri will proudly support her when she is commissioned and officially enters the U.S. Navy fleet». The Lockheed Martin-led industry team is currently in full-rate production of the Freedom-variant of the LCS, and has delivered four ships to the U.S. Navy to date. The future USS St. Louis (LCS-19) is one of seven ships in various stages of construction at Fincantieri Marinette Marine, with two more in long-lead production. LCS-19 will be the seventh ship to bear the name USS St. Louis. The first St. Louis, a sloop of war, was launched in 1828. Other ships to bear the name included an ironclad gunboat commissioned in 1862, a troop transport commissioned in 1898, a protected cruiser in commission from 1906 to 1922, a light cruiser commissioned in 1939, and, most recently, a Charleston-class amphibious cargo ship in service from 1969 to 1991. The Lockheed Martin-led LCS team is comprised of shipbuilder Fincantieri Marinette Marine, naval architect Gibbs & Cox, and more than 800 suppliers in 42 states. The Freedom-variant’s steel monohull design is based on a proven, resilient design recognized for its stability and reliability. Costing less than a third of a brand new Arleigh Burke-class destroyer, the Littoral Combat Ship is the Navy’s most affordable surface combatant shipbuilding program and the ideal platform to grow the U.S. Navy fleet quickly and affordably.